Today is 46th Anniversary of the start of Tet Offensive, one of the largest military campaigns of the Vietnam War. Beginning on 30 January 1968, Viet Cong and North Vietnamese forces launched country wide attacks on United States and South Vietnamese forces that completely exposed the lie being told to the American people by President Lyndon Johnson and his military leadership that the Vietnam War was winding down and the US was winning. Instead we awoke to the news that the national liberation forces had people everywhere and were carrying out what they called the "General Offensive and Uprising" (Cuộc Tổng tiến công và nổi dậy). The American command in Vietnam has reported over 5,000 people dead after two days intensive fighting. South Vietnamese President Nguyen Van Thieu has been forced to declare martial law as communist forces, under General Vo Nguyen Giap, have kept up sustained assaults on several fronts - from Saigon in the south to Hue in the north. Authorities in the North Vietnamese capital Hanoi, described it as, "a more powerful and more continuous offensive" than ever before. White House intelligence in Washington anticipated attacks over the Tet holiday to celebrate the lunar new year, but they were surprised by their intensity. Vietcong forces have also attacked the Vietnam general staff headquarters, Navy headquarters, two police stations and the Philippine Ambassador's residence as well as blowing up the radio station in Saigon. Communications are in chaos and commercial flights from the airport have been cancelled. North Vietnamese - Vietminh - troops have reinforced their siege of Khe Sanh, near the demilitarised zone. Some commentators expect the so-called Tet Offensive will shatter the American resolve and have a similar effect on the US to that on the French after the North Vietnamese victory at Dien Bien Phu in 1954 - which contributed to the Geneva Agreements later that year. Note that even as late as '68, the BBC hadn't got the memo from US military PsyOps that the Viet Minh were being rebranded as the "Viet Cong." General Vo Nguyen Giap who led the Viet Minh forces against the French and then the United States, and was the architect of their victories both at Dien Bien Phu and the Tet Offensive, died in 2013 at the ripe old age of 102. With the success of the Tet Offensive and the consequential exposure of the real weakness of the US position in Vietnam, the end did indeed come into view, serious Peace Talks began in Paris in May of that year. Although this first round of talks were sabotaged through the combined efforts of Richard Nixon and Henry Kissinger, and it would take another four years of killing and dying before US ground troops finally left Vietnam, the Tet Offensive, which began 46 years ago today, told everybody just how things were going to turn out. To learn more about the Tet Offensive and the Vietnam War. 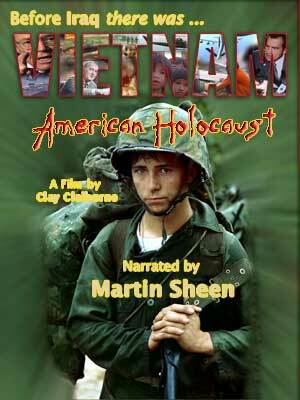 See my documentary film Vietnam: American Holocaust. It is available both from VietnamAmericanHolocaust.com and Amazon. However, I do not trust the military one bit and this report is very, very worrying. The revolution still has a long way to go. We must all be very alert, very aware and not drop our guard for one minute. Please post this on April 6th, We are all Khalid Said, etc. as I do not have access to facebook right now, and distribute as widely as possible. 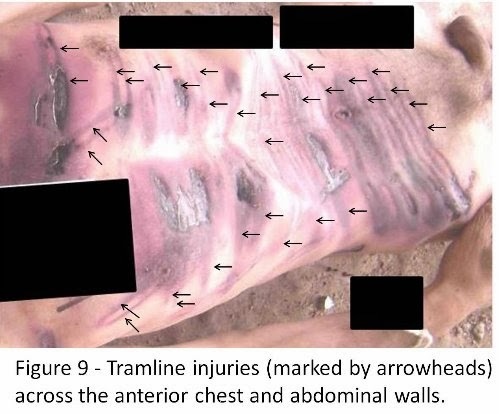 The pictures are horrific, the torture details revolting, the numbers terrifying. And the integrity of the three former prosecutors who have effectively accused the Syrian government of war crimes, are without blemish. Shrivelled, blood-spattered corpses provide unstoppable evidence of regime cruelty – just as the videotapes of Syrian rebel executions tell us what kind of Syria may soon exist if the insurrection against Bashar al-Assad succeeds. Besides, everyone knows that the Assad regime – from father Hafez onwards – has employed torture and executions to preserve the doubtful purity of the Baath party. So why not, indeed, talk of war crimes? Well, let’s just remember that the 11,000 prisoners reportedly done to death by the Syrian regime is only just over half the total number of Syrians – 20,000 – reportedly killed by Hafez’s brother’s troops in the besieged Syrian city of Hama in 1982. He tries to minimize the import of those 11,000 deaths in detention by ignoring the fact that they represent the work of one photographer and only a fraction of those murdered in detention, not to mention the 130,000 other Syrians killed in Bashar al-Assad's bloody suppression, so that he can compare those 11,000 in a favorable light to the 20,000 killed by his father. Is this what passes for progress in the mind of Robert Fisk? So how come we are not demanding war crimes trials for those responsible for that even greater massacre, whose perpetrators – reported at the time and recounted in numerous books afterwards — came from the ranks of the special units commanded by Rifaat al-Assad. Could it be that we have just forgotten this even more terrible massacre? Or could it be – since Rifaat, who has denied any role in the Hama operations, now lives in safety in Paris and sometimes in London, protected by our own European security services – that we don’t have the inclination to pursue that particular bloodbath? Of course this report was timed to come out just before the Swiss talks. Would Fisk prefer that it come out after... or, perhaps, not at all? 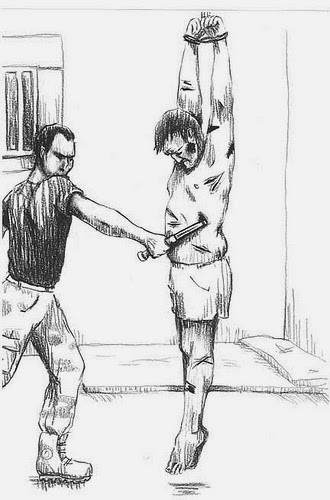 We know that Amnesty International issued a report on the Assad Regime's "systemic and widespread torture and ill-treatment in detention" in March 2012, Human Rights Watch released a comprehensive report on Assad's death camps some six months ago, that various eye witness reports have come out over the years, and the Obama administration was shown some of these photos in November but choose to remain silent. I would think these photos are enough to cause the Qatar royal family or anyone else to viscerally hate Bashar al-Assad. The question this paragraph raises is, having admitted that these photos represent a true picture of how Assad treats his fellow Syrians, why is Robert Fisk still concerned about "his hopes of a future role in Syria, even in a ‘transitional’ Syrian government?" Indeed, one is reminded – in terms of political purpose rather than historical parallel, of course — of Nazi Germany’s disclosure of the mass graves of 22,000 Polish officers and civilians murdered by the Soviet secret police in 1940 at Katyn, in that part of Russia newly occupied by German troops. The Nazis claimed the Soviets were responsible – in the hope that this would divide Stalin’s alliance with America and Britain. The Allies denounced the Nazis for the massacre – although it was indeed committed by the Soviets. Does Qatar now hope to divide Syria’s alliance with Russia and Iran with similar evidence of Syrian government mass murder? So photos of emaciated and tortured bodies emerge, photos that remind anyone with a knowledge of history of those we saw when Buchenwald and Auschwitz were liberated, and with this sleight-of-hand, Fisk compares, not Assad, but Qatar, with the Nazis, because he finds the timing inappropriate. This is the work of a propagandist trying to spin a damaging revelation, not a journalist looking for the truth. The regime’s enemies can parade those terrifying pictures which Qatar has made available. But war and peace in Syria will not be decided by this horror show. Certainly not, if propagandist Robert Fisk has anything to say about it! Goebbels, with his journalistic skills, thus soon became a key ally of Strasser in his struggle with the Bavarians over the party program.... In 1925, Goebbels published an open letter to "my friends of the left," urging unity between socialists and Nazis against the capitalists. "You and I," he wrote, "we are fighting one another although we are not really enemies." Today we are presenting two new sets of photos from the holocaust Bashar al-Assad has created in Syria. One is from a new set of the 55,000 photos of 11,000 people tortured and murdered by the Assad regime while being held in detection. They are marked Getty Images and were published by the Daily Mail in the UK. I published the first set of these photos and the story behind them here. 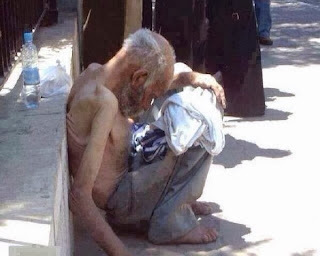 The second set is of those still living but every day threatened with death by the Assad regime's siege of the Palestinian refugee camp in Yarmouk, Damascus. They were taken by Sunday Times reporter Hala Jaber and published on her twitter account. This criminal conduct by the Assad regime could not continue without the acquiescence of the majority of people on the planet and their governments, so ultimately, the blame for these deaths should be put not only on Bashar al-Assad but should also be laid at the door steps of all those that have done nothing to protest it or stop it and thereby answered that age old question "Am I my brother's keeper?" in the negative. 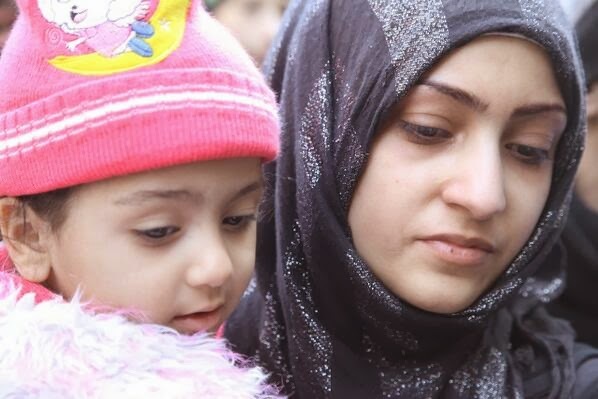 Diyala and daughter Halla, "Get me out of here … save my daughter." 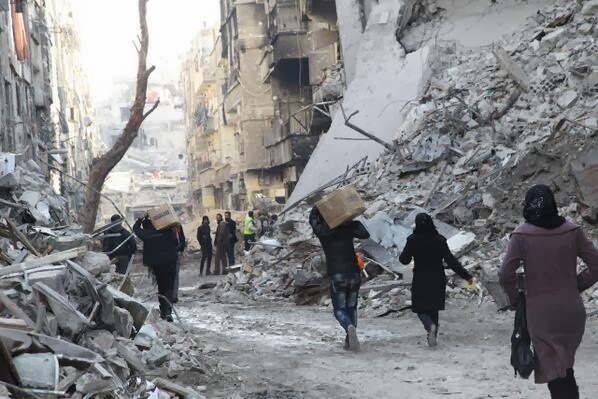 BEIRUT: A United Nations agency seeking to deliver humanitarian aid to a besieged district of Damascus said on Sunday state checkpoint authorities had hampered its work, despite government assurances it would allow the distributions. 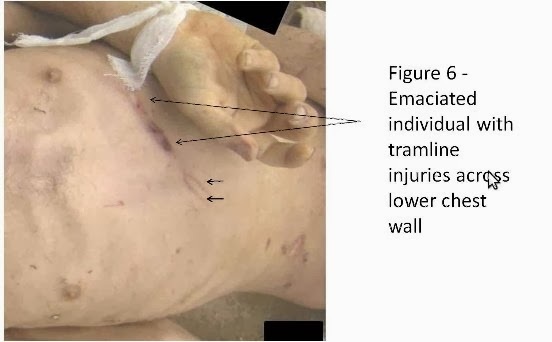 More photographs showing the maimed bodies of alleged victims of ‘systematic killings’ in Syrian prisons have been released today. 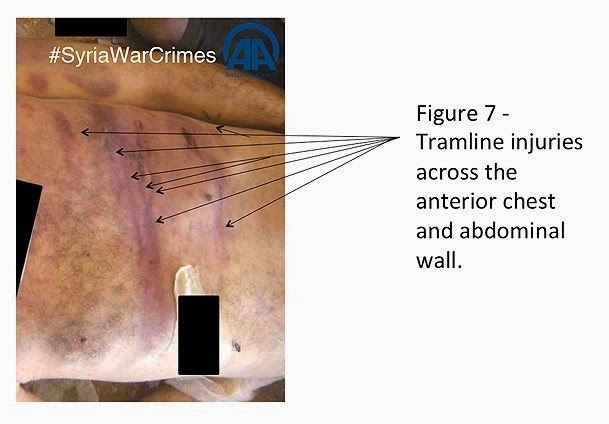 The second cache of photos paints an even clearer image of the horrendous conditions and gruesome torture in government-run jails in Syria. Diyala and Halla will leave the camp. Syria people queueing to collect food baskets. Going back into camp with food basket. He's choked with tears & couldn't talk just said "don't forget us in here." Women come to collect food baskets. He says he was never witness to executions, nor did he see torture taking place. That wasn’t his job. His task was that of taking photos of the corpses afterwards. 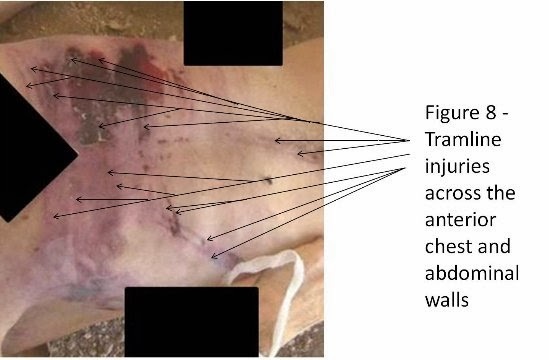 He would snap four or five images per body — of the face and other parts of the person — documenting the cause of death, insofar as it was possible to determine. He did so tens of thousands of times between March 2011 and August 2013 — when he finally fled Syria, taking some 55,000 photos with him on a USB stick. 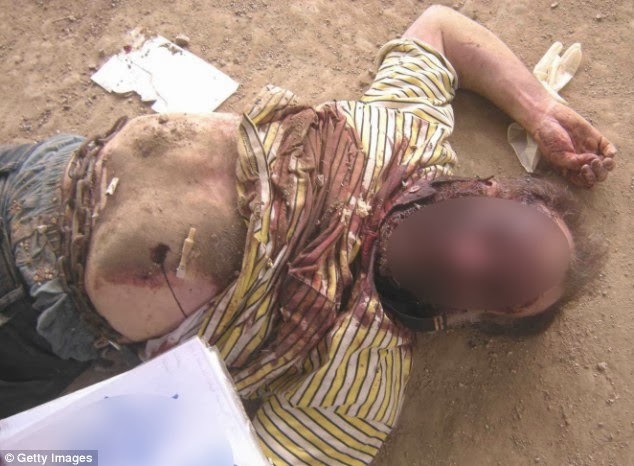 The images are of starved, strangled and tortured men, primarily young and mostly naked. Some have no eyes. 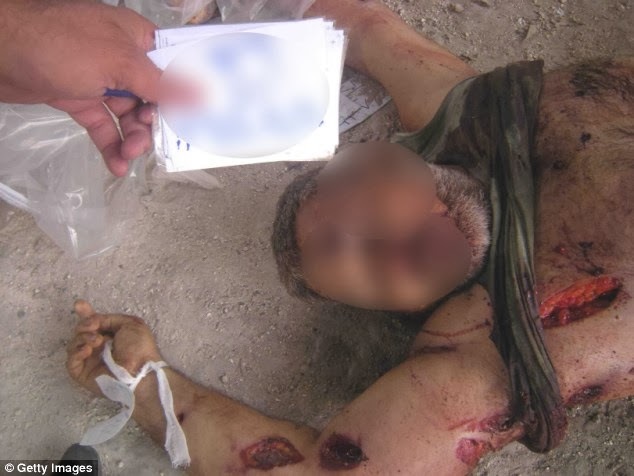 The defector, who has been cited under the alias “Caesar,” worked for the Syrian military, and says that he and his colleagues were called on up to 50 times a day to photograph corpses, each of which was given a number for documentation purposes. The investigation and report undertaken by the British law firm was financed by Qatar, which likely explains the fact that it was made public concurrently with last week’s Syria conference in Geneva. Qatar backs the Syrian rebels, but the country’s stance does little to take away from the power of the images provided. Caesar was likely but a small cog in the bureaucratic machine of death. But his photographs could be decisive in proving potential crimes against humanity committed by the regime of Syrian President Bashar al-Assad. They provide visual evidence to back up previous claims made by other witnesses. The images are also consistent — down to the details — with previously unpublished witness accounts provided to SPIEGEL during the past 20 months of reporting. Those accounts indicate that the vast military hospitals in Homs and Harasta, outside Damascus, became transfer points for the victims of Syria’s military and of the various secret services and militias. The dead, the witness accounts indicate, are centrally registered, photographed and then taken to mass graves in the desert regions in the eastern part of the country, which are still controlled by the regime. Every day, several deliveries arrived, “most of them from different quarters and suburbs of Homs, like Bab Sbaa or Houla,” Ahmed J. said. Twice a week, a large, refrigerated truck with no license plate picked up the white body bags. He says he doesn’t know where they were taken. “We weren’t allowed to ask questions.” Ahmed J.’s assignment ended on March 23 and he defected two months later. He now lives in Turkey. A military doctor from the city of Rastan who defected later likewise had an assignment in the Homs military hospital in mid-March, 2012. He too provided details from the corpse collection site, which he saw in the exact same hospital courtyard. “I was there only briefly, but there were hundreds. They could hardly have all died or been killed in the hospital,” he said. He wasn’t witness to a corpse removal operation, saying he only saw soldiers packing the dead in white body bags. Until deep into 2012, the military security agency, the air force secret service, the state security apparatus and other agencies often worked at cross purposes. Many of those wanted by the authorities could escape as a result — because, for example, he was on one agency’s list but not on that of another. Given the confusion, documenting who killed whom perhaps became more important than covering up the whole operation. 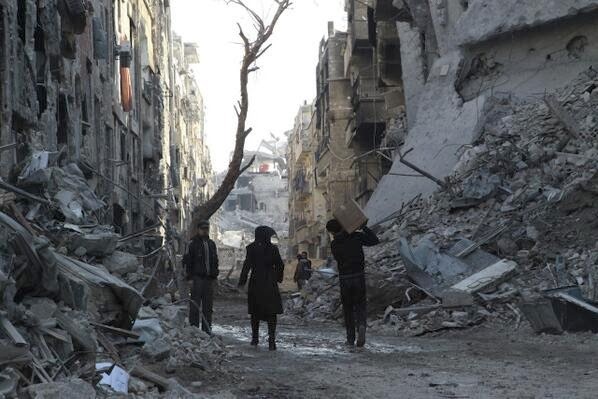 Beginning in February 2012, thousands of Homs residents disappeared in the wake of the 4th Division’s attack on the city. Whether the victims belonged to the opposition or not was irrelevant for the subsequent death sentences — the wrong address was often enough. But the men whose corpses the soldier and the military doctor later saw in the inner courtyard of the Homs military hospital did not yet show indications of systemic starvation, as is evident in many of the images provided by Caesar. That began later. Starting in 2013, severely emaciated corpses and released prisoners began appearing. The British doctor Abbas Khan, who arrived in Syria at the end of 2012 to help treat the wounded in hospitals, was also taken into custody by the army and tortured to death in a prison belonging to the military security agency. For an entire year, his family sought his release; his mother travelled to Damascus and even managed to visit her son with the help of diplomats, lawyers and middlemen. She said later he had been tortured with burning cigarettes and electric shocks and was clearly suffering from starvation, weighing just over 30 kilograms (66 pounds). “He was like a skeleton,” she said. A British parliamentarian promised to travel to Syria to seek his release and the family was hopeful. But then, on Dec. 17, came official word that Abbas Khan had hanged himself in his cell. His sister Sara, noting that he had become increasingly hopeful that he would soon be released, has said she doesn’t believe the suicide story. 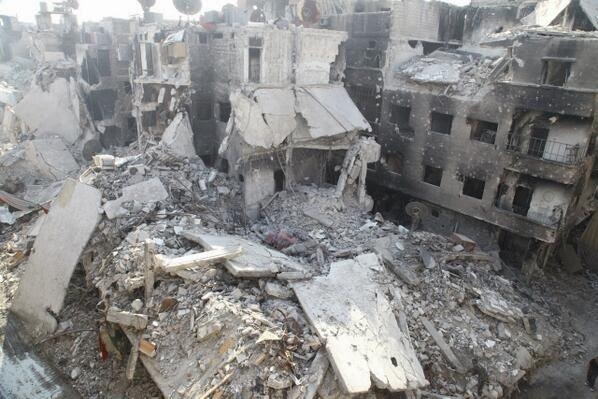 Corpse collection points such as that in Homs were established in Damascus as well. It was a mistake that led to a real estate agent spending five days in the heart of the apocalypse there during his search for his brother. He had been killed, apparently in error, in November 2012. He was told he could also look at photos of the 1,550 people from in and around Damascus that had been killed in the last two months. “But, they said apologetically, they were only the ones from their service. They didn’t have the others.” But number 417 was not among them. Mohammed 14 years old…"I don't want to die here"
Żagiew ("The Torch"), also known as Żydowska Gwardia Wolności (the "Jewish Freedom Guard"), was a Nazi-collaborationist Jewish agent provocateur group in the Nazi German-occupied Poland, founded and sponsored by the Germans and led by Abraham Gancwajch. Many Żagiew members were related to the collaborationist Jewish organization Group 13, which was also led by Gancwajch. The Nazis had over a thousand Jewish secret agents in Poland and some were permitted by their Gestapo handlers to possess and bear firearms. The organization operated primarily within the Warsaw Ghetto. Its primary goal was to infiltrate the Jewish resistance network and reveal its connections with the Polish underground aiding and hiding Jews in the General Government. The organization was able to inflict considerable damage on both fronts. Żagiew agents were also instrumental in organizing the Hotel Polski affair in Warsaw, a German scheme to lure the richer Jews under false promises of evacuation to South America into a trap and then steal their money and valuables before killing them. MONTREUX, Switzerland — Michel Kilo, a member of the Syrian National Coalition delegation participating in the Geneva II talks, said that the opposition is preparing its own case implicating the Syrian government in collaboration with terrorist groups including the Islamic State of Iraq and al-Sham (ISIS). “There are photos that have been found of several emirs of ISIS with [Syrian President] Bashar al-Assad,” said Kilo, who spoke with Al-Monitor on the sidelines of the Geneva II talks. “The pictures were taken before they became emirs in ISIS, when they were all officers in the Syrian special service. There are documents sent by the special service to ISIS telling them to capture or kidnap people in Raqqa and Jarabalus, and these documents will be published. And you will see how the regime fabricated these extremist groups that did not exist in our country at the beginning of the revolution. Bashar al-Assad says that he wants the Geneva II conference that kicks off tomorrow to focus on the problem of terrorism in Syria but when he speaks of terrorism he is referring to the imperialist definition of "terrorism" which certainly includes bombs delivered by cars but excludes bombs delivered by planes. Specifically, he using the term the way it has been promoted by the US imperialists, especially after the 9/11 attacks, to mean exclusively attacks by Islamic militants. He hopes to use the western phobia of Islamic terrorism to win support for his regime and its crackdown on Syrians who want to oust his regime. That is why he claims that his opposition is 80-90% al Qaeda. Using this definition, it becomes clear that Bashar al-Assad is the biggest terrorist in Syria. He has killed over a hundred-thousand Syrians in an effort to maintain his political power. So by all means, Geneva II should focus on ridding Syria of terrorists, starting with the one that has used the most bombs and killed the most people, and moving next to his terrorist allies in the ISIS and al Nusra. 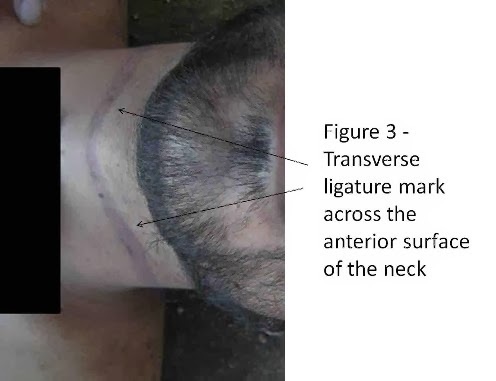 Yesterday, the story broke on a new proof of Assad's war crimes contained in a report on 55,000 photos taken of 11,000 detainees that had been tortured and executed. This is also terrorism. I reported on it in this post Is Assad running largest death factories since Hitler?. While the photos are shocking, no one should act as if its news that Assad is doing this while the world looked the other way. I reported this story back in August, 5,000 Assad Regime Prisoners Executed, Dumped in Mass Grave in Al Qutaifah, and eighteen months ago Human Rights Watch made an extensive report on what they called Assad's Torture Archipelago, at the time, they didn't have photos so they used line drawings to illustrate the abuses they uncovered. 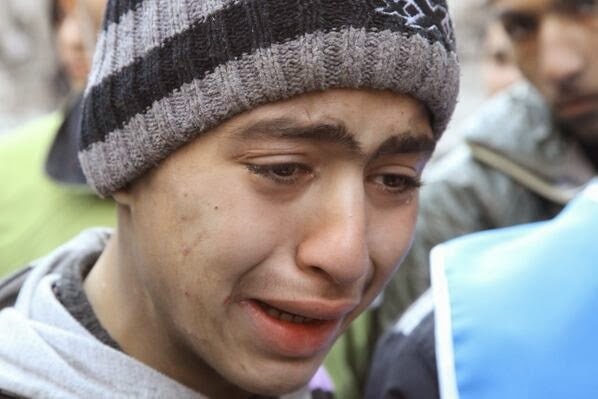 I reported on it in this post HRW releases torture report on Syria. Now we have pictures of the human cost of the world ignoring that report and everything else that shows Assad is the biggest terrorist in Syria and quite possibly, the world. One way to measure the horrific suffering of Syria’s increasingly violent war is through the experience of Syrian children. More than one million children are now refugees. At least 11,500 have been killed because of the armed conflict, well over half of these because of the direct bombing of schools, homes, and health centers, and roughly 1,500 have been executed, shot by snipers or tortured to death. At least 128 were killed in the chemical massacre in August. In this conflict only the Assad Regime has an air force capable of bombing schools, homes, and health centers, and those children were killed by Assad's terrorist bombs dropped from planes. "Assad’s vow to strike terrorism with an iron fist is nothing more than bare-faced hypocrisy." Al Arabiya News Channel aired a video on Monday showing detained members of al-Qaeda’s offshoot in Syria, with some telling stories that suggest links to the Syrian regime. There has been heavy fighting between the Free Syrian Army (FSA) and the Islamic State of Iraq and Syria (ISIS). The fighting broke out last month after reports that ISIS, the al-Qaeda affiliate, was enforcing a strict version of Shariah in the areas it controls and was carrying out mass executions of fellow rebel fighters it accuses of apostasy. The FSA, joined with other moderate rebel groups, declared a war on ISIS, accusing it of cooperating with the regime of President Bashar al-Assad and of seeking to divide rebels. Ever since the fighting broke out many in both sides were killed or detained. Some of those al-Qaeda members who fell to rebels’ hands said ISIS had ties with the Syrian regime. “It happened once that a Syrian regime officer and 11 others defected and drove their vehicle through Masila [north of Raqqa]. We received ordered to arrest them and hand them over back to the regime,” a detained al-Qaeda member said. He said ISIS was behind a bombing that destroyed Raqqa’s train station last year. “We received orders from Commander Abu Anas al-Iraqi to bomb the train station. We were also ordered to fire on ambulances and civilians trying to reach the victims,” he said. Abu Anas al-Iraqi leads an al-Qaeda brigade in the province of Raqqa. He is nicknamed al-Iraqi after his country Iraq, where he used to work as an intelligence officer, according to another detainee. “Abu Anas is financed directly by the regime, through Iran and Iraq. His brigade is specialized in kidnappings, car bombs and targeted assassinations of FSA members,” the detainee said. While several ISIS members shown on the video were reportedly captured during fighting, many said they defected after realizing the brutality and the agenda of the al-Qaeda affiliate. Of course, Assad is playing both ends against the people because while he has been a major force in creating and sustaining the Islamist terrorists groups, he offers Western intelligence his 'co-operation' in fighting them. Now, having released these terrorists from his jails and seen that they got a good source of funding, he is posed to make co-operation in fighting them the centerpiece of his Geneva II strategy. Is Assad running largest death factories since Hitler? It wasn't just the number of bodies that made Hitler's mass killings of civilians during World War II so horrific, it was the methodical way the Nazis went about it. It wasn't just the slaughter than comes from shot and shell in every war; it was the industrial way much of the slaughter was carried out, with highly organizes ways of killing, counting the dead and disposing of the bodies. Today we have been provide with new evidence that the Assad regime is killing it opponents on a massive scale, and not just with barrel bombs and sarin gas in their homes. He is also torturing and murdering thousands of detainees without anything that could be considered due process. A former member of the military service for the Syrian government for thirteen years was set to photograph and document the dead bodies of military soldiers brought from their places of detention to a military hospital during the civil war in the country. The bodies brought to the hospital, fully consisted of detained-Syrian opposition members, which showed signs of starvation, brutal beatings, strangulation and other forms of torture and killing. 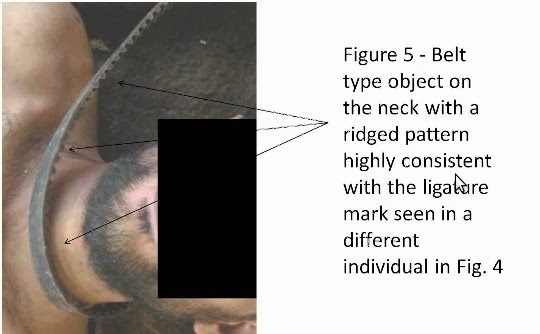 It became routine for the military service to take photographs of the bodies and faces of people in detention after designating those with a 'numbering system', who had been brought to the hospital after being tortured and killed. The Guardian and CNN also got exclusive access to the report and ran stories, which I cite here. I have also extracted the ten pieces of photo evidence from the pdf report and included them here as jpegs than can easily be copied and used elsewhere. They subjected all evidence to rigorous scrutiny, according to their report, which has been obtained by the Guardian and CNN. The defector, who for security reasons is identified only as Caesar, was a photographer with the Syrian military police. He smuggled the images out of the country on memory sticks to a contact in the Syrian National Movement, which is supported by the Gulf state of Qatar. Qatar, which has financed and armed rebel groups, has called for the overthrow of Assad and demanded his prosecution for war crimes. A team of internationally renowned war crimes prosecutors and forensic experts has found "direct evidence" of "systematic torture and killing" by the Syrian President Bashar al-Assad's regime, the lawyers on the team say in a new report. Crane, the first chief prosecutor of the Special Court for Sierra Leone, indicted former Liberian President Charles Taylor for war crimes and crimes against humanity. Taylor went on to become the first former head of state convicted of war crimes since World War II. He was sentenced to 50 years in prison. CNN cannot independently confirm the authenticity of the photographs, documents and testimony referenced in the report, and is relying on the conclusions of the team behind it, which includes international criminal prosecutors, a forensic pathologist, an anthropologist and an expert in digital imaging. 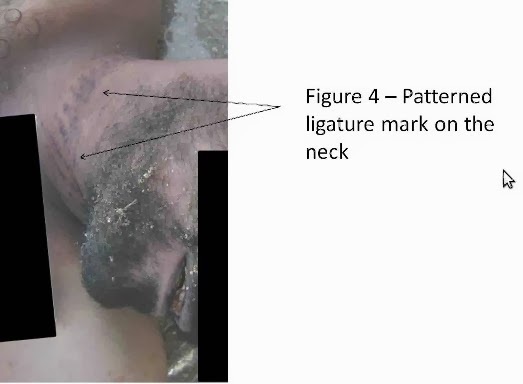 The bodies in the photos showed signs of starvation, brutal beatings, strangulation, and other forms of torture and killing, according to the report. 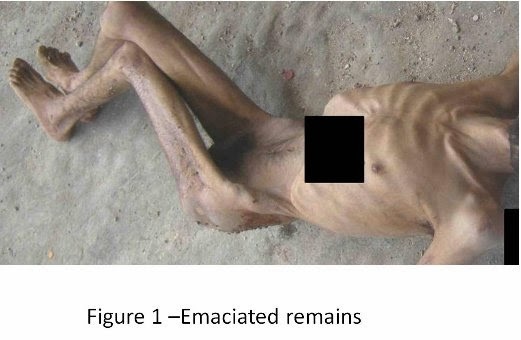 In a group of photos of 150 individuals examined in detail by the experts, 62% of the bodies showed emaciation -- severely low body weight with a hollow appearance indicating starvation. The majority of all of the victims were men most likely aged 20-40. A complex numbering system was also used to catalog the corpses, with only the relevant intelligence service knowing the identities of the corpses. It was an effort, the report says, to keep track of which security service was responsible for the death, and then later to provide false documentation that the person had died in a hospital. 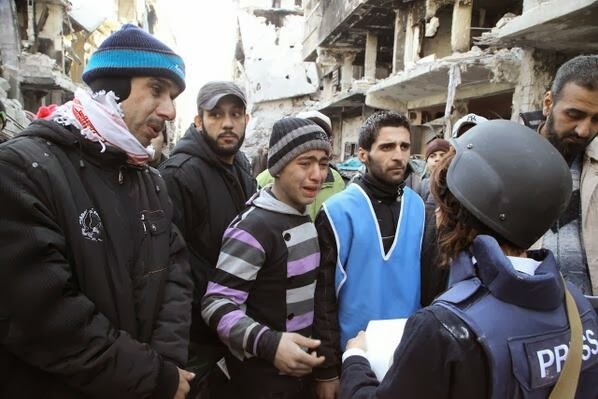 I've been reporting on the plight of Palestinian refugees in Yarmouk since July and August of 2012 and its good to see these concerns being written about in the main stream media and voiced by more people in the peace and justice movement, but along with this wakening to the humanitarian disaster that is unfolding in Yarmouk is a narrative that seeks to sow confusion as to the Assad regime's responsibility for the siege. In a lesser-told side of Syria’s civil war, Muslim clerics have reportedly issued a fatwa, or religious ruling, allowing people to eat dogs, cats and donkeys as residents of rebel-held South Damascus face starvation conditions. 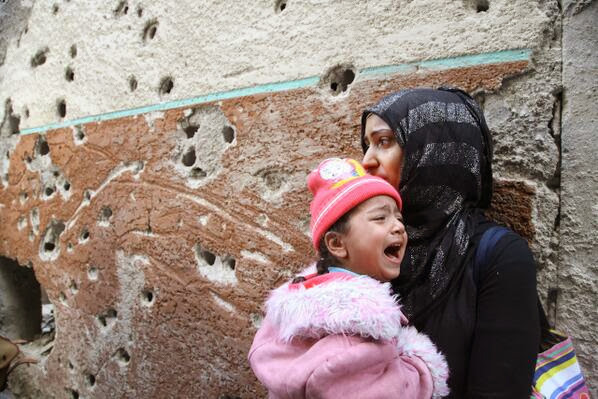 The Financial Times reports areas, including parts of the Yarmouk Palestinian refugee camp, have faced an almost total blockade of supplies since the summer, leaving some residents to subsist on leaves, animal feed and the contents of garbage bins. Signs on pro-government checkpoints read "hunger or kneel." The United Nations is urgently appealing for access to a Palestinian area of Damascus where people are dying from hunger. A U.N. official says some 20,000 Palestinians are trapped inside the Yarmouk district of Damascus amid fighting between the regime and rebels. Since the last delivery of U.N. aid in September, 15 people have died there from malnutrition, including five this past weekend. 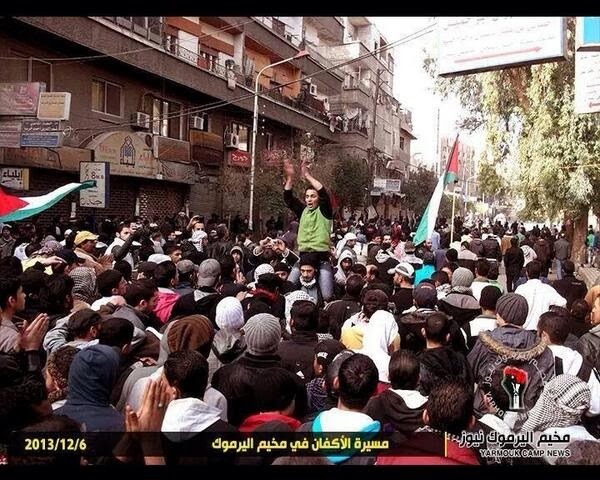 Is it also possible that there are Palestinians inside Yarmouk that are fighting to keep the regime out? Where would they fit in this formulation? When these two questions are considered, I think the bankruptcy of the "20,000 Palestinians are trapped inside the Yarmouk district of Damascus amid fighting between the regime and rebels" formulation is revealed. 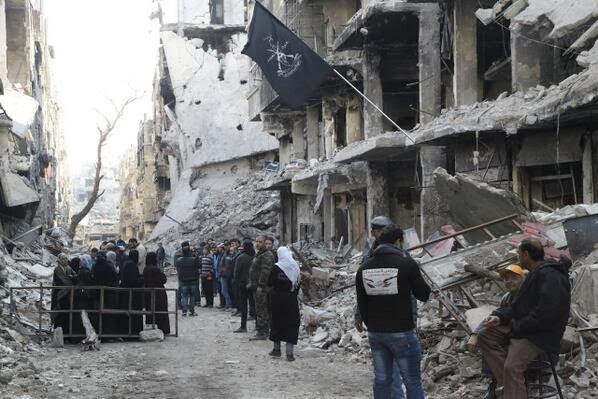 Who provides support and backup for the anti-regime fighters in Yarmouk such that they have been able to hold the regime forces at bay for over a year? 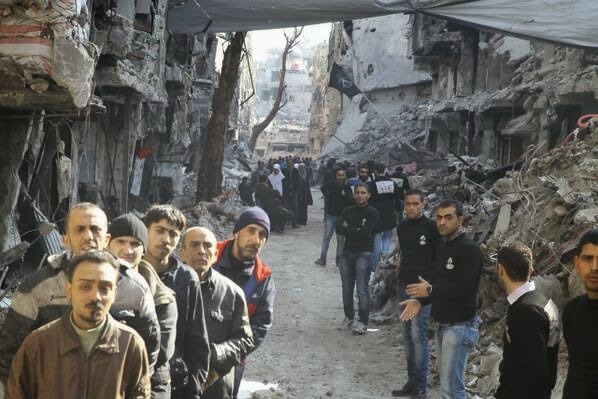 Statements of “solidarity” with Palestinian refugees in Yarmouk are emerging one after the other. Albeit very late as it took some groups 200 days to assemble the courage to announce to the world that they are aware of the crisis that has befell the camp. However, what is characteristic and outrageous in these statements is the evident lack of any willingness to hold the Assad regime accountable for this inhumane siege and premeditated starvation of the refugees. For example, the US Palestinian Community Network issued a statement that “expresses great concern regarding the escalating crisis.” Logically, an expression of “great concern” must be accompanied with an examination into why does one “express concern” about a ‘thing’ or an ‘event.’ Something somewhere must have happened to trigger an emotional and intellectual exercise of concern, and this something must be elucidated very clearly. Evidently, this is not the case in the statement issued by USPCN. The few words that followed their “expression of concern” speak of an “escalating crisis” without paying an attention (intentionally or unintentionally) to the root causes of this crisis – and let me break it to you: it is not Israel. 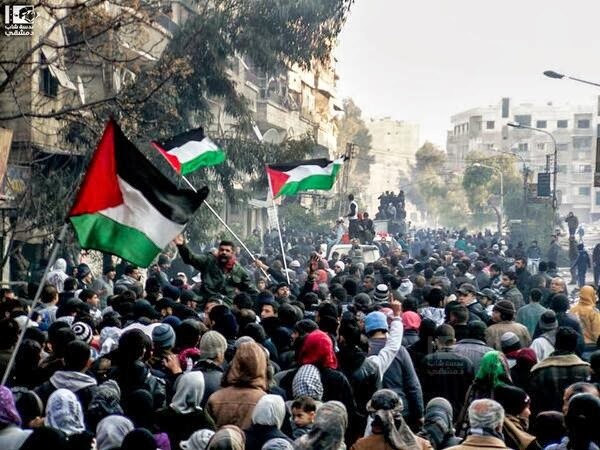 There is no doubt that the Yarmoukian Palestinians are in Syria because of a historic injustice imposed upon them by a settler-colonial enemy that does not spare any effort to exacerbate their suffering and prolong their exile. However, this indisputable historic occurrence should not blind us from the fact that independent of what Israel has planned to increase Palestinian suffering, the party responsible for the current crisis (and here I must reiterate my emphasis on the word ‘current’) is the brutal and inhuman Syrian regime and its leader Bashar El-Assad. The Syrian revolution is not an international conspiracy planned and constructed behind closed offices in Tel Aviv and Washington, it is an honorable revolution of a people who suffered from unbearable brutalities exacted upon it by a regime designed specifically to ensure unconditional subservience and zero dissent. This revolution, despite normal and regrettable setbacks that characterize any revolution, should not be castigated as yet another attempt by international conspirators intending to further destabilize the oil rich Arab World. And this revolution should not be used by the Palestinian left to score political points at the expense of the hundreds of thousands of Syrians who, for the past sixty years, provided their brothers and sisters with home and shelter. Assad and his regime must be held responsible for everything that is happening to the every single person who currently resides in Syria. It must be held responsible for the crisis because it is the direct result of its dictatorial policies in the region. It must be held responsible for its inaction in the face of demands for political and economic reforms. In this particular historical event, it is not Israel that is causing the suffering of the Palestinians and Syrians, it is the Syrian regime. Armed groups would not be able to smuggle weapons and fighters through Syria’s porous borders if the regime were competent in anything other than the murder of its own people. This is not meant to be an attack on USPCN. The statement issued by the said group did, however, provide me with a reason to write. Similar statement that disregard the root causes of the Syrian conflicts are readily available on the internet. The real motivation for writing this article is to demonstrate that “solidarity” with the refugees in Yarmouk, and similar calls for “return and liberation” mean absolutely nothing without expressly condemning the Syrian regime for its atrocious acts, and demand, alongside their brothers and sisters in Syria, for its removal from power. - Omar Chaaban is a Palestinian activist based in Vancouver, BC. He holds a BA in International Relations from the University of British Columbia and focuses on Syria and Palestine. He contributed this article to PalestineChronicle.com. Visit his blog: http://omar-chaaban.blogspot.ca, and follow him on: @al3isawy. Seventy-One years ago yesterday, on 18 January 1943, the Warsaw Ghetto uprising began when the newly formed ZOB [Jewish Fighting Group] attacked German troops queuing up people to be sent to the extermination camps. That had never happened before. Three days later, the Nazi's shot a thousand people in retaliation but the armed resistance continued and the deportations were halted for a while. Probably there were those who blamed the ZOB and not the Nazi's for the thousand shot and blamed all the slaughter on fighting between the rebels and the regime. Two resistance organizations, the ŻZW and ŻOB, took control of the Ghetto. They built dozens of fighting posts and executed a number of Nazi collaborators, including Jewish Police officers, members of the fake (German-sponsored and controlled) resistance organization Żagiew [shades of the ISIS? - clayclai], as well as Gestapo and Abwehr agents (such as Judenrat member Dr Alfred Nossig, executed on 22 February 1943). The ŻOB established a prison to hold and execute traitors and collaborators. Notify Amnesty International, all these people were held and executed by the rebels without proper trial! So you see, even in the case of the Warsaw Ghetto uprising against the Nazis, we can use that old standby "both sides committed war crimes", "both sides did bad things", to avoid taking sides even in the holocaust against the Jews.